I'm still reading If Walls Could Talk: An Intimate History of the Home by Lucy Worsley, a nonfiction book from NetGalley. 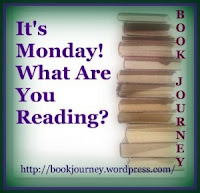 And I'm reading my April bookclub selection, Girl with the Pearl Earring by Tracy Chevalier. I'm nearing the end of both of those books. Next, I'll be reading another nonfiction book from NetGalley: Drinking from the Fire Hose: Making Smarter Decisions without Drowning in Information by Christopher J. Frank and Paul F. Magnone. I hear you, Julie! It's been busy here, too - no time for reviews last week, though I did manage (barely) to post a Monday update. I haven't read Girl with the Pearl Earring, but we saw the movie. I have heard about Drinking from the Fire Hose - it sounds very interesting. I can't wait to hear what you think of it. I'm looking forward to that one too. I have a few business-related books on my TBR list now. I read and reviewed Gods and Fathers as well. My post is up today. I hope you'll stop by. My week wasn't terribly productive in the reading department either, but this week looks promising! I look forward to reading your review too! Drinking from the Fire Hose sounds like an interesting book! I'm reading The Beautiful and the Damned by F Scott Fitzgerald right now. I really need to read more classics. I hope you're enjoying it! I have If Walls Could Talk sitting on my kindle from NetGalley as well I have high hopes for it. +new follower :) Looking forward to reading more of your reviews. If Walls Could Talk definitely has some very interesting tid bits of information about how people lived over the centuries. Thank you! It is true indeed. Sorry I am a bit late stopping by this week, I've been swamped! I hope you enjoyed your mini break!